Like I have previously done with wide receivers and running backs, today I’m going to look at tight ends who have been drafted for this offense to see if there’s a physical profile they typically follow. In order to increase the sample size, I looked at every tight end drafted for a Reid offense in Philadelphia (1999-2012, 2016-18 with Doug Pederson) or Kansas City (2013-present). This list included ten players. Then I combed through their Combine performance to see if any patterns emerged. They are light. According to Mock Draftable, the average tight end at the Combine weighs in at around 255 pounds, but the average for the 10 TEs in this sample was just under 250 pounds. The heaviest tight end here was L.J. Smith, who weighed in at 258 pounds, in just the 67th percentile for all tight ends. Meanwhile, 3 of the 10 tight ends weighed in at 245 pounds or less, which falls in the bottom 15% for all tight ends. They are fast. 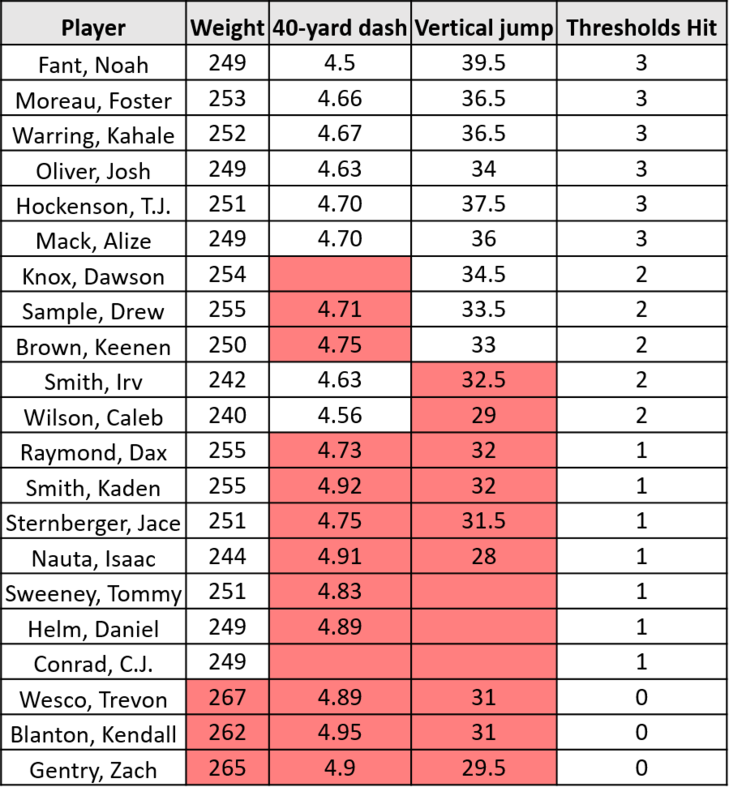 The average Combine 40 time for all TEs is 4.72 seconds, but for this sample it was 4.70. That is significantly skewed by Cornelius Ingram, who ran a 4.96. If you remove him from the sample, the average 40 time for the other 9 players is 4.67 seconds, with 7 of the 9 coming in under 4.70. Ingram ended up being a poor fit in Reid’s offense, as he lasted just one year in Philadelphia after being drafted in the 5th round. They can jump. The average tight end at the Combine has a vertical jump of just under 33 inches, but the average in this sample is 34.3, with 8 of the 10 coming in at 33 inches or better. This then gives us a rough profile of a tight end who would be targeted as a pass catcher in this offense. They should be under 260 pounds, run a sub 4.70 40, and have a 33″ or better vertical jump. These all make sense. The main purpose of a TE in this offense (at least for the U TE) is to be able to catch passes. They need to be athletic and able to challenge defenses down the field. Now let’s look at which tight ends in the draft this year fit the profile. The table below shows all of the tight ends from the Combine, sorted by how many thresholds they hit. Misses are highlighted in red. Like I always say with this approach, hitting the thresholds doesn’t mean a player will magically be good in this offense. It simply means the player fits the physical profile of others who have filled this role in the offense. Not all misses are the same. Irv Smith posting a 32.5″ vertical jump isn’t all that different from Keene Brown posting a 33″ vertical jump, but one is a miss and the other is a hit because I had to set a cutoff somewhere. There are a number of TEs who fit the physical profile of a pass-catching TE in this offense and could be available in the later rounds this year. It would be wise for the Bears to consider adding such a player since Trey Burton is overpaid and could be a cap casualty candidate as soon as after the 2019 season. Players to keep an eye on include Foster Moreau, Kahale Warring, Drew Sample, Dawson Knox, and Alize Mack. What late-round TE do you want to see the Bears target?